Régis Messac (1893-1945) was a writer who had pursued an academic career in the 1920s but (without an academic job in France) turned more and more to writing and to politics. He translated some American science fiction, and wrote a number of articles on science fiction. 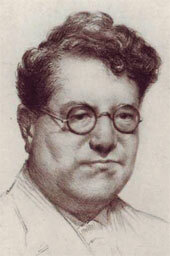 In 1935 he started a new publishing line called “Les Hypermondes”, which was intended to be a science fiction series. In the end he only published three volumes in the series: his own novel Quinzinzinzili (1935); a collection of short stories by the American sf writer David H. Keller, translated by himself: La guerre du lierre (1936); and his own La cité des asphyxiés (1937). The title of Quinzinzinzili derives from the distorted religious chant of qui es in coelis by the children and their schoolmaster who are the sole survivors of a future chemical war. Their descendants relapse into barbarism, but eventually a new and better civilisation is born. La cité des asphyxiés is concerned with time travel and with the paradoxes involved. The time-traveller to the future finds an underground city, with weird customs, which Messac describes with satirical intent. Education consists mostly of the minute study of meteorology, which has perforce to be largely theoretical, since they live underground. Régis Messac was born in Champagnac (Charente), the son of a teacher and a school inspector. He was taught in various primary schools, and did his secondary education at Châtellerault and in Versailles. En 1914, he began studying at the Lycée Condorcet in Paris, but the Great War intervened. He was demobilised on 15 April 1919, and in order to express his disgust at the war, he wrote two autobiographical novels (Le Voyage de Néania and Ordre de transport), a play, and various poems. During leave in 1915 and after the war he finished his education, and he became a teacher at the Lycée in Auch (1922-1923), and then a lecturer at the University of Glasgow (1923-24) and a professor at McGill University in Montreal (1924-29). In 1929 he defended his thesis in Paris on the detective novel and the influence of scientific thought and, as a subsidiary thesis, a work on French influences in the work of Edgar Allan Poe, and he obtained his doctorate. However, he did not end up with a university job, as he hoped, but became a teacher at the lycée in Montpellier. Another autobiographical novel, L’homme assiégé, expressed his unhappiness at this. In 1936 he moved to Coutances in Normandy. Since the end of the First World War, Messac had been publishing a very large number of political articles and pamphlets, on the themes of corruption, of the collusion between finance and politics, on pacifism, on feminism, and so on. He was devoted to the ideals of peace and non-violence, and used to boast that he had never actually harmed an enemy. From January 1930 he published a great deal in the review Les Primaires, which he edited himself from January 1932 to March 1940. During the early years of the Second World War, Messac compiled Pot-pourri Fantôme, a chronicle of the war years and of the German occupation, and a bitter critique of Vichy. It has been described as one of the best descriptions of life in France during these years. In 1941 he joined the National Front, a communist resistance group in the north. He was arrested in Coutances on 10 May 1943, and condemned to a year in prison; but he was deported to Germany to face a German military tribunal in Breslau. On 4 September 1943 he declared to the tribunal that he “had never professed or preached hatred against the Germans” and that he would have been “ready to shake the hand of the German soldier who had shot him at the beginning of the war of 1914”. He was in the concentration camp of Natzweiller-Struthof in Alsace from November 1943 to 10 July 1944), in the prison of Brieg in Silesia (July to October 1944), and in the concentration camp of Gross Rosen from October 1944. He may have gone from there to Dora, and perhaps from Dora to Bergen-Belsen, but early in 1945 he disappears from the record: there is nothing on him after 19 January 1945. Reports from survivors say that he had actively tried to help his fellow-inmates, and that he initially refused to use his good knowledge of German to try to get an easier position for himself. He did at the end of 1944 agree to act as interpreter, which brought him a small and temporary amount of relief. The French government later posthumously awarded him the croix de guerre and gave him the honorary title of sub-lieutenant.